Jacques Anquetil again tried to do what only Fausto Coppi had done, win the Giro and the Tour de France in the same year. Anquetil took the lead in the stage five time trial. From then on Anquetil rode with tactical economy, maintaining his lead to the end, despite strong attempts to take the lead by Franco Balmamion and Italo Zilioli. Anquetil went on to win the Tour de France in 1964, completing his historic double. Anquetil had been busy during the last two years. He won the Vuelta in 1963, making him at that time the only rider to have won all three Grand Tours. With victories in the 1957, ’61, ’62 and ’63 Tours he became the winningest Tour de France rider in history, exceeding the three victories of Philippe Thys and Louison Bobet. At this point in his career he had more or less given up on single-day races, feeling that they left too much to chance. He explained that in an extended stage race the ability to overcome a momentary misfortune is far greater. As Merckx said, the Tour de France was the easiest race to win because it was the hardest. Despite this, in the spring of 1964 Anquetil picked a classic that was particularly suited to his talents, Gent–Wevelgem, and won it. He took off in the closing kilometers and the raging, pursuing Belgians could do nothing to prevent the speedy Frenchman from crossing the line alone, hands off the bars. The big shiny bauble still missing from his collection of racing jewels was the Giro-Tour double. Coppi had done it twice but Anquetil, with twice the Tour victories of Coppi, had been unable to put the pair of races in his win column in the same year. The competition for him in 1964 would be particularly tough. Balmamion was there, riding for Cynar, as well as Adorni, Battistini, Pambianco and Defilippis. Moreover Anquetil would face a new crop of Italian competitors. Many of the class that had grown up in the difficult postwar era were already used up, old before their time. The multi-talented Franco Bitossi, who turned pro in 1962, was starting to assert himself, having taken second in the Tour of Romandie. Also there would be rising stars Italo Zilioli (leader of the Carpano team since Balmamion and Defilippis had moved to other teams) and Gianni Motta. The first stage started in the Trentino-Alto Adige city of Bolzano and headed south for Riva del Garda. Adorni won, with Taccone, Pambianco and most of the pack two seconds behind, and as he had in 1963, became year’s the first maglia rosa. The next day another member of the new class, Michele Dancelli, was part of a break which arrived in Bréscia 64 seconds before the peloton and became the new leader. The third stage was pretty bumpy with the Presolana and Bura ascents. A break with Enzo Moser, Carlesi and Bitossi was first into San Pellegrino. It was good enough to move the Pink Jersey to Moser, making it three days and three different leaders. Moser kept the lead until the day everyone knew Anquetil was waiting for, the stage five Parma 50.4-kilometer individual time trial. 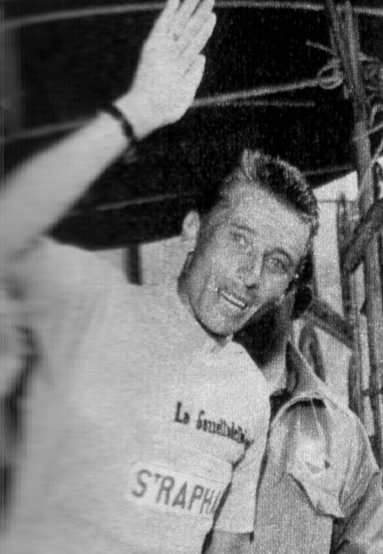 Although it was still early in the race, Anquetil decided to try to keep the jersey until the end. There were two Dolomite stages, numbers seven and eight. In the seventh stage Defilippis and Zilioli were among nine riders able to separate themselves from the main pack, but Anquetil, Adorni, Balmamion and the other contenders finished with the front chasing group that had kept the escapees on a short leash. No change to the top of the standings. The young Signori Zilioli and Motta would bear watching. Anquetil teammate Guy Ignolin related a couple of anecdotes to Anquetil biographer Paul Howard, shedding an interesting light on racing in Italy before television covered a large part of each stage. In one stage Pambianco asked permission to go off the front to greet his wife. This is normally a concession that is freely given and in this case it was. While Ignolin had a bad feeling about this, Anquetil’s instincts towards his fellow racers were normally very generous. Not so noble was Pambianco, who used the winding roads through the small towns to escape the peloton. Feeling that the 1961 Giro winner could not be allowed to wander about the parcours without supervision, Anquetil led the chase to bring the fleeing Arnaldo back to the fold. On another stage, ridden on a rocky, unpaved road which caused many riders to suffer multiple punctures, Anquetil’s follow car also flatted. Géminiani, Anquetil’s director, had the team mechanic ride Anquetil’s spare bike behind the peloton over the last few kilometers just in case it should be needed—wearing his mechanic’s coveralls, by the way. Géminiani’s car finished the stage on the wheel rim. In stage ten with its climb to the finish at San Marino, Anquetil and Zilioli stayed with their most serious competitors and both finished right behind the day’s winner Rolf Maurer while De Rosso struggled in a minute and a half later. De Rosso was now 1 minute 41 seconds back. As the race went down the eastern side of Italy Anquetil made good his goal of keeping the lead. De Rosso lost his second place on the hard Apennine roads in stage twelve with its three tough ascents, allowing Zilioli to replace him. Today’s perfectly orderly, highly policed stage starts were not in place a half-century ago. The crowds could mingle with the riders during the line-up for the start and when given the signal the pack would usually clip in and roll out without much urgency. It was probably during stage thirteen (Roccaraso–Caserta, 1964’s southernmost stage) that large crowds surrounded Anquetil and his team, preventing him and his team from rolling off with the peloton. Desperate to join the pack, Anquetil finally raised his bike over his head and started swinging it to get the mob to part. That did it. After a short but vigorous chase Anquetil and his team were able to join the race. Torriani had decided to make the twentieth stage a super-tappone. In homage to the seventeenth stage of the 1949 Giro where Coppi had done his legendary Alpine ride and had been first over all five major passes, Torriani planned to send the riders over the same leg-shattering 254 kilometers. The stage started in Cuneo and went over the Maddalena, Vars, Izoard, Montgenèvre and Sestriere ascents. The standings hadn’t changed much since the San Marino stage, except that Renzo Fontona had slipped away with Franco Bitossi in stage sixteen and had moved up to second place. 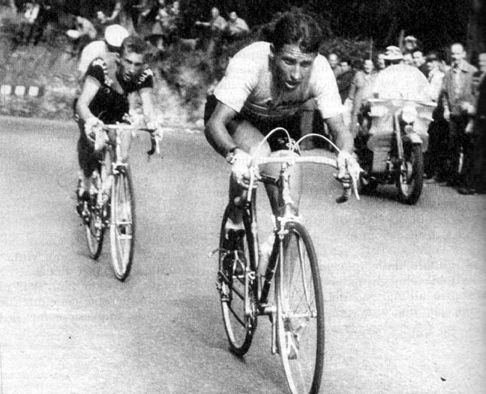 Anquetil’s reputation had generally been one of a man who climbed well enough but lacked the ability to use the mountains as a tool of aggression. In the 1963 Tour he confounded his critics by conducting a climbing master class in the Pyrenees. Yet, the Italians generally thought that the extraordinary challenges of stage twenty would be severe enough to put him in difficulty. If not now, when? If not here, where? There were only three stages left. This might have been the thought process going on in Zilioli’s head when he attacked on the first climb and was first over the Maddalena. On the Vars the speed and the severity of the attacks put Anquetil on the edge of crisis while Zilioli stuck with the lead group, riding easily and quite unfazed by the drama that was around him. Balmamion had studied the race route in detail and figured that the Izoard would be the climb that would land him back in pink. Just before the mammoth ascent began Balmamion dismounted to urinate, a thoughtful step because the stage would take almost eight and a half hours to complete. Delayed by an embarrassing difficulty while answering nature’s call, he eventually got back on his bike, knowing that the perfect moment to seize the race had passed. 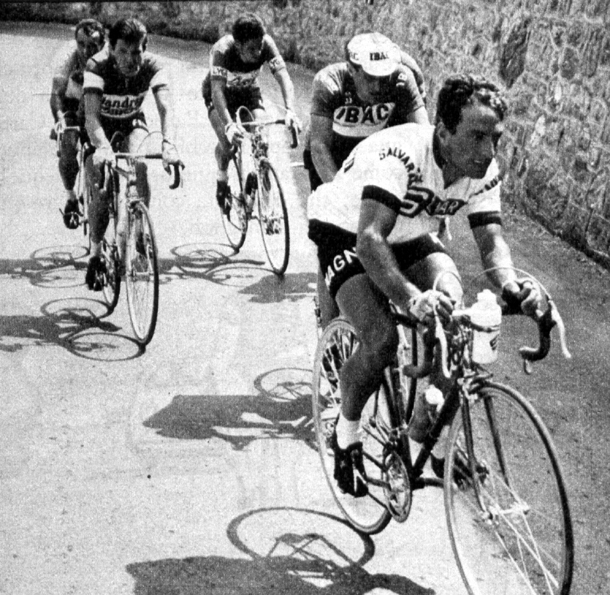 Franco Bitossi took matters into his own hands and rocketed away, being first over the final three climbs, while Anquetil recovered and was able to stay with the front chase group. Bitossi rode into Pinerolo alone, two minutes ahead of the Anquetil/Adorni/Zilioli group while a distraught Balmamion finished five minutes after Bitossi along with Fontona and Defilippis. The second Alpine stage, from Turin to Biella had no effect upon the fight for the Pink Jersey. The race was Anquetil’s. Probably no other race so perfectly exemplifies the Anquetil way of winning a stage race than the 1964 Giro. He stayed out of trouble and carefully made sure he didn’t waste a single watt. Then he pounced in the long time trial and built a lead that he defended with skill and intelligence the rest of the race. In July Anquetil went on to narrowly win the Tour after a fierce fight with Raymond Poulidor that forced both riders to go as deep as they had ever gone. Not only did the 1964 Tour win make him the first ever five-time winner, Anquetil finally settled his score with Coppi by being the first foreign rider to do the Giro-Tour double. Without question, at that time Anquetil was the finest living racer and at the peak of his powers. He would never again win a Grand Tour nor even find a place on the Tour podium. But he was not yet done with the Giro. Not by a long shot.